More than 2,000 people living on the “peripheries” will enjoy a special “Circus of Solidarity” on January 11, 2018, thanks to Pope Francis, the Vatican announced January 10, 2018. “The Holy Father is offering a ticket for a fun-filled evening to more than 2,000 of Rome’s poor or homeless people, several refugees, a group of prisoners, and many families in great need,” said Vatican News. 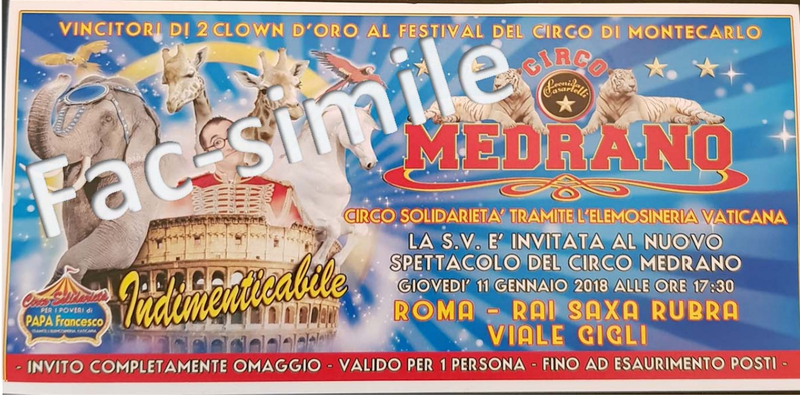 The event will be held at the Medrano Circus in Rome’s northern Saxa Rubra district. In addition to the circus, there will be a sack supper and medical care available. Pope Francis has indicated he is a bit of a circus fan. In September, he received — in the Clementine Hall of the Apostolic Vatican Palace – the members of the National Association of Owners of the Traveling Show (ANESV), on the 70th anniversary of the Association’s activity. The Holy Father thanked these representatives of the world of the traveling show, for the work they do with their art and joy in so many places and countries. And, “how can God’s hand not be” in this vocation, in this mission? “God loves us and wants us to be happy,” because His mark is wherever there is simple and clean joy.” Therefore, if they preserve these values, this authenticity and simplicity, they are messengers of Joy that pleases God, and that comes from Him.